In the month of April, the NAC 2OE class (Grade 10, Aboriginal Peoples of Canada, Open) of 24 students at Tagwi Secondary School began learning about the Indian Residential School system in Canada. Students were both appalled and shocked to learn about the atrocities that impacted First Nation, Inuit, and Metis children in Canada, up until the last Indian Residential School closed in 1996. Several students asked their teacher, Mr. Coleman, why they had never heard or learned about the Indian Residential School system before. Students were genuinely interested and engaged in learning about this dark part of Canada’s history. To supplement the PRoject of Heart curriculum package, students watched the documentary “Muffins for Granny” and completed activities from the Ontario Ministry of Education “Think Literacy” document based on Residential Schools. Students then used the primary sources obtained in the Project of Heart curriculum package to write apology letters to the victims of the Indian Residential School system. Upon finishing the apology letters, students then decorated the wooden tiles received in the Project of Heart curriculum package. Aboriginal Program Resource Teacher for the Upper Canada District School Board, Mr. Romaine Mitchell, was invited into the NAC 2O class as a guest speaker and to perform a traditional smudging ceremony. 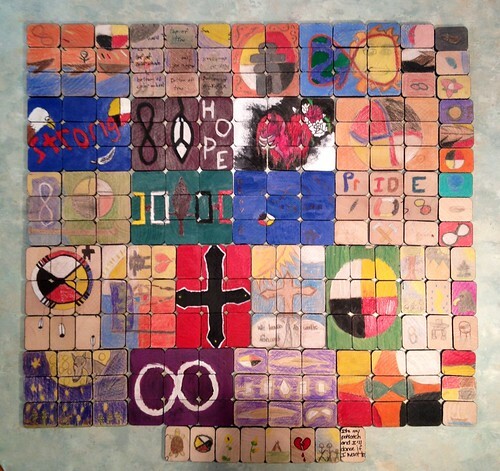 Mr. Mitchell, a Mohawk of Akwasasne, smudged the tiles and then each student. The students found this authentic experiential learning opportunity very enjoyable. It was the first time that any of the students had participated in a First Nations spiritual ceremony. After the smudging ceremony, students then began Part 1 of their final culminating activity on social justice issues within First Nations, Inuit, and Metis communities across Canada. Topics researched included: Aboriginal justices, current educational issues, substance abuse, and women’s issues.